The Laparoscopic Sleeve Gastrectomy – often called “the sleeve” – is performed by removing approximately 80 percent of the stomach. The remaining stomach is a tubular pouch that resembles a banana. This procedure works by several mechanisms. First, the new stomach pouch holds a considerably smaller volume than the normal stomach and helps to significantly reduce the amount of food (and thus calories) that can be consumed. The greater impact, however, seems to be the effect the surgery has on gut hormones that impact a number of factors including hunger, satiety, and blood sugar control. Short term studies show that the sleeve is as effective as the roux-en-Y gastric bypass in terms of weight loss and improvement or remission of diabetes. There is also evidence that suggest the sleeve, similar to the gastric bypass, is effective in improving type 2 diabetes independent of the weight loss. The complication rates of the sleeve fall between those of the adjustable gastric band and the roux-en-y gastric bypass. Am I A Candidate for Sleeve Gastrectomy Surgery? Sleeve Gastrectomy Surgery is not right for everyone. Here are some of the things we will consider when evaluating your candidacy for sleeve gastrectomy surgery. The Sleeve procedure is indicated for use in weight reduction for severely obese patients with a Body Mass Index (BMI) of at least 40 or a BMI of at least 35 with one or more severe co-morbid conditions, or those who are 100 lbs. or more over their estimated ideal weight. Your BMI is 40 or higher or you weigh at least twice your ideal weight or you weigh at least 100 pounds more than your ideal weight. (BMI is calculated by dividing body weight (lbs.) by height in inches squared (in²) and multiplying that amount by 703). You have been overweight for more than 5 years. You do not have any other disease that may have caused your obesity. You are prepared to make substantial changes in your eating habits and lifestyle. You do not drink alcohol in excess. If you do not meet the BMI or weight criteria, you still may be considered for surgery if your BMI is at least 35 and you are suffering from serious health problems related to obesity. 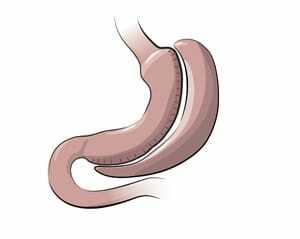 Has a higher early complication rate than the adjustable gastric banding. While the laparoscopic sleeve gastrectomy is an effective treatment for morbid obesity, the pounds do not come off by themselves. The operation is an aid to support you in achieving lasting results by limiting food intake, reducing appetite and slowing digestion. However, your motivation and commitment to adopt a new lifestyle are extremely important for long-term weight loss. You must be committed to new eating habits for the rest of your life. Exercise is an equally important component of a changed lifestyle. The Sleeve Gastrectomy is a permanent non reversible operation. You should use contraception if you are still in the child bearing age group. Weight loss and increase your fertility due to hormone changes. Overeating and eating too fast can cause discomfort and eventually an enlarged stomach. This is turn will decrease your ability to eat small portions and weight gain may be the end result. Due to the lower portion of the stomach being cut stapled and removed you are at risk for leakage along the staple line. The esophagus can also become tight and narrow causing a stenosis or narrow opening. There is also a risk of developing an incisional hernia. Of course these complications can be treated with additional surgery. How will gastric sleeve help me lose weight? Most of the stomach is removed, leaving a small, banana-shaped stomach that helps restrict the amount of food you can eat at one time. This helps you feel fuller sooner and longer. A typical hospital stay is 1-2 days after surgery. Can I exercise or go back to work? We will ask you to walk when you get home, but check with your surgeon about exercise programs, driving or going back to work. Will I need to follow a special diet? In the months before surgery we will ask you to try to eat healthier foods to lose weight and be in better shape for your surgery. In the hospital right after surgery and when you go home your diet will be liquids only. You will follow a progressive staged nutrition plan that will slowly take you through different textures of foods from liquid to puree to soft solids then eventually regular foods. This may take up to four to six weeks. How often will I see the doctor after surgery? You will have an appointment about one to two weeks after surgery, then routine visits through the first year after. After this time it is very important to see your surgeon every year. You may expect to lose 77 % of excess weight in the first three years after surgery. Long-term success depends on commitment to diet and lifestyle changes. Remember – surgery is not a quick fix. It is a tool to help you with your weight loss. Do I need vitamins or supplements? You will need to take vitamins for the rest of your life. Each person is different but you must take: Multivitamins and Calcium. References: 1. Himpens J, et al. Annals Surg. 2010;252(2): 319-323. 2. DeMaria EJ, et al. Surg Obes Relat Dis. 2010;6:347-355.